Apple acquired a tiny sleeping tracking device startup Beddit in May last year. The tech giant has finally made good of the deal by launching a new version 3.5 of Beddit Sleep Monitor. The new product clearly signals that Apple wants to break into the health and fitness tracking market. The Beddit Sleep Monitor version 3.5 is functionally almost identical to its predecessor version 3.0, though it does bring some minor hardware improvements. It is capable of tracking your sleep duration, snoring, breathing, heart rate, room temperature and humidity. The launch was first reported by Cnet. The new Beddit Sleep Monitor echoes Apple’s design philosophy. Unlike its predecessor, the new version has hidden the stitches and includes a dedicated opening for the USB cable. It is available for $150 from the Accessories section of Apple’s website. The new accessory promises to help you “measure, manage, and improve your sleep.” When you set daily bedtime and sleep time goals, Beddit will motivate you to achieve them via notifications such as bedtime reminders, morning results, and weekly results. You have to download the Beddit app for Model 3.5 from the App Store to see the stats. It requires the iOS 12 software, meaning it should work with the iPhone 5S and later. If you are using an older version of iOS, you are out of luck. The latest sleep tracker is not compatible with Android phones either. The original Beddit app has been renamed “Beddit (for Model 3.0)” and works with iOS 9 or later. 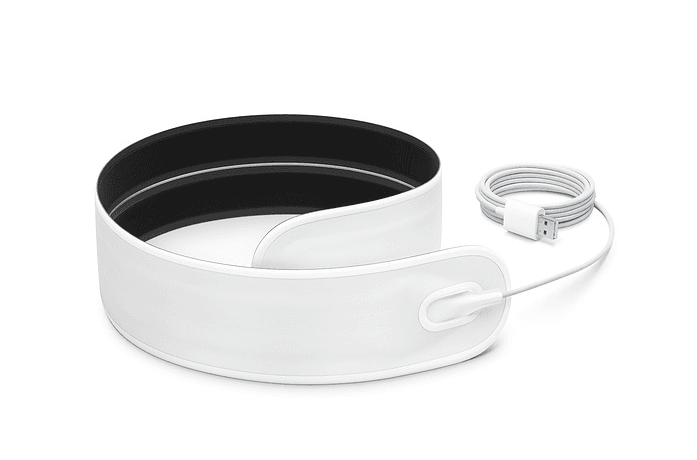 The sleep tracker syncs with the HealthKit software on your iPhone. It’s a thin strip that you can place on your mattress. It works with any size of bed, any size mattress, and with one or two people in a bed. However, it can’t track the second person unless they have their own sleep tracker. According to the FCC website, Apple registered the new Beddit Sleep Monitor with the FCC only a few days ago. The new tracker retains the Beddit branding with no sign of the Apple logo. But its design is very Apple-sque. The product is labeled as “Design by Beddit in California, Assembled in China,” which is similar to the wording Apple uses on its products. Earlier this year, Apple filed patents for a sleeping tracking technology similar to Beddit’s. Though the tech giant is selling sleep monitors separately, it could incorporate sleep tracking capabilities into the future versions of Apple Watch. The current Apple Watch requires nightly charging, so it’s not suitable for sleep tracking at this point. If Apple decides to add sleep tracking to the Watch, it has to first focus on extending the battery life of the wearable device. The latest Apple Watch Series 4 brings a bunch of health tracking features such as heart rate monitoring. Apple is also said to be working on blood glucose monitoring technologies that could eventually find their way into the Apple Watch. Sleep tracking is still a nascent industry with fairly little competition. Beddit’s rival Withings, previously owned by Nokia, also sells a sleep tracking product called Sleep. Withings’ device costs only $100 and comes with advanced sleep tracking, home automation, and personalized coaching. Unlike Beddit, it is compatible with both Android and iPhone.